Footage from an episode of RTE's Today Tonight series addressing the need for hospice care in Ireland. The footage features interviews with Dr John McCarthy from Our Lady's hospice in Harold's cross Dublin discussing the lack of pain control and hospice services for terminal patients. The footage also features interviews with a GP and Margo Mc Cambridge Matron of the Royal Hospital on issues related to providing care for terminally ill patients and controlling pain. A lengthy interview with Pauline Ellis a young woman with terminal cancer dying in our lady's hospice Harolds Cross. Pauline talks about her care in Our Lady's. This episode of Today Tonight was aired on April 23 1986, a day after the official launch of the Irish Hospice Foundation and its discussion about the state of care for dying patients generated an enormous response from viewers who contacted the hospice foundation offering donations and help. It was instrumental in raising public awareness of the lack of dedicated hospice care for the terminally ill and helped the Irish Hospice Foundation begin its campaign to extend hospice and palliative care across Ireland. 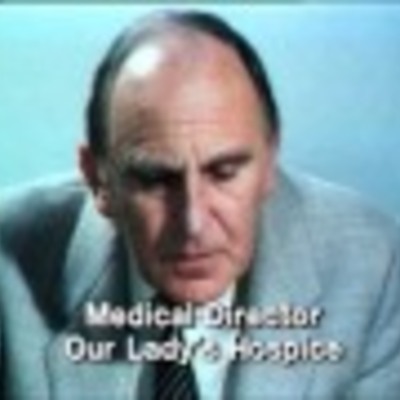 RTE- Raidió Teilifís Éireann, “Today Tonight (RTE) 'A hospice for the dying' episode aired April 23 1986,” Archives Hospice Foundation, accessed April 21, 2019, http://archives.hospicefoundation.ie/document/1854.